Two remote sensing satellites, both part of the Yaogan-32 family, are launched by a Long March-2C rocket with an attached upper stage named Yuanzheng-1S, or Expedition-1S, at the Jiuquan Satellite Launch Center in Jiuquan, northwest China's Gansu Province, Oct. 9, 2018. The satellites have entered their planned orbits and will be used for electromagnetic environment surveys and other related technology tests. Photo is courtesy of Xinhua/Wang Jiangbo. 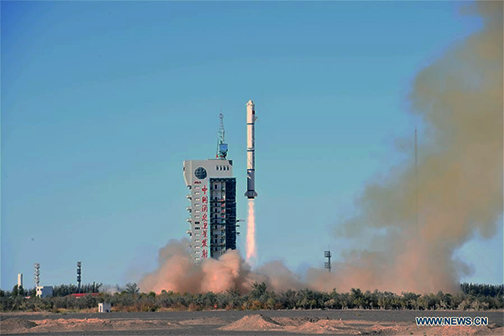 In a new posting at XINHUANET, two remote sensing satellites were successfully sent into space on Tuesday from the Jiuquan Satellite Launch Center in northwest China. The satellites, both part of the Yaogan-32 family, were launched by a Long March-2C rocket with an attached upper stage at 10:43 a.m. Beijing time. The satellites have entered their planned orbits and they will be used for electromagnetic environment surveys and other related technology tests. This was the first flight of the upper stage named Yuanzheng-1S, or Expedition-1S., which wored well with the Long March-2C rocket and significantly improved the carrying capacity of the rocket, according to the China Academy of Launch Vehicle Technology. Upper stages are independent spacecraft installed on the carrier rocket that are capable of restarting their engines multiple times in space to allow them to send different payloads into varying orbits. They are also referred to as space shuttles. In February of this year, the Yuanzheng-1 rocket upper stage sent two satellites into orbit on a single carrier rocket for China's BeiDou Navigation Satellite System. The Yuanzheng-1S, a simplified version of the Yuanzheng-1, is designed for short flights, and will be mainly used for commercial launches, according to Cui Zhaoyun, deputy chief designer of the upper stage. Previously, the Long March-2C rocket was capable of sending payloads of about 1.2 tons into SSO. Installed with the Yuanzheng-1S upper stage, the carrying capacity of the rocket has been increased to two tond, according to Cui. This launch was the 286th mission in the Long March rocket series.